Taste a Piece of Washington's history! Velatis is now located in downtown Silver Spring, Maryland. In 2009 the Servais family reestablished the iconic DC caramel company in the metropolitan Washington area. The little store, on Georgia Avenue, often catches the attention of people passing by and many of them rush in to share stories and memories of its days at 9th and G streets or at Woodward and Lothrop. Customers excitedly order candy to be sent to family members all over the country so that they too can recapture a taste of their past. The company has evolved with the times. A younger population now considers themselves caramel connoisseurs. Our online presence has made Velatis easily accessible for those who have moved away from the region but still crave a little taste of home. In addition to the caramels made with the original recipes since 1866, Velatis has added a number of confections that you will find online. Toffee, caramel turtles, and ice cream toppings have become staple menu items that our customers have embraced and enjoyed as much as the original caramels. 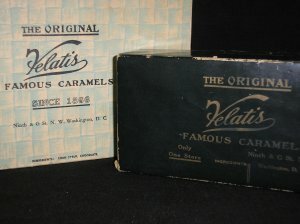 Velatis offers two distinct types of caramels in a variety of flavors. The traditional “Chewy” caramels are sticky, longer lasting and have a smooth creamy finish. We also offer the lesser known but equally sought after “Sugary” caramels. These caramels have a crumbly almost praline or fudge-like texture. A variety of nuts are used to flavor these caramels as well as coffee, chocolate, and marshmallows. Seasonally, Velatis offers specialty flavors such as Pumpkin Spice, Black Cherry Brandy, and Eggnog to name a few. Aromas of caramelizing sugars will greet you upon entering the store front in Silver Spring, Maryland. This location is not only the sole retail branch, it also is the location of the Velatis kitchen where all of the caramels and other handmade confections are produced. A window separates you from the kitchen where you can view employees mixing, pouring and hand cutting caramels. Along with the caramels, toffee, turtles and ice cream topping available online, a number of treats are offered only in the store. You will find a variety of caramel themed baked goods as well as some handcrafted Belgian chocolate items such as dipped pretzels, seasonal novelty shaped solid chocolates, non pareils, caramel filled chocolate covered Oreos, and chocolate drizzled caramel coated divinity. The experienced Velatis’ employees are well versed in putting together the perfect gift for all occasions. Whether you are ordering favors for your big day, wishing a friend a speedy recovery or just treating yourself to something sweet they are there to answer all questions and help you through your special purchase with a friendly smile. Old fashioned service is a hallmark of our store.